Got some interesting news for ya from the artbook front. First, it appears Amazon will be restocking MM25: Mega Man & Mega Man X Official Complete Works. UDON informed me this is not a reprint, rather, Amazon probably grabbed a few remaining new copies from a sub-distributor. Second, UDON sends word that MM25 is sold out at the publisher, without plans to reprint. But they are, however, preparing some new editions that contain the same material for a fall release. It's not MM25, per se, but I think you're gonna like what they're cooking. More details to come. In the meantime you might want to pick up Amazon's copies while supply lasts. Order yours here! What ? What about MM25 PLUS ? 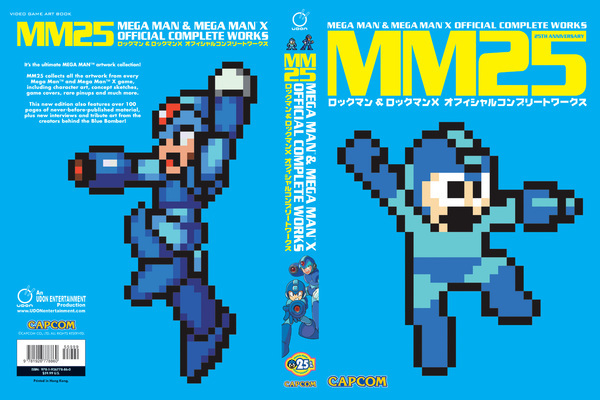 MegaMan 9 and 10 arts are in it. This doesnt included MegaMan 9 and MegaMan 10 arts. Correct me if I am wrong, Protodude. No, 9 and 10 are in MM25. They weren't in the original releases. I mean MM25 plus 5. Then what art images that are in MM25 Plus 5 which isn't in MM25, Protodude ? I am confused. There is no MM25+. There was Rockman 20+5 which came over to the US as MM25. This is a restock of MM25. The books coming out in the fall are a little different. That's all I can say. To be fair though, the Rockman 20+5 is literally the same as the Rockman and Rockman X Complete works put together with some X-Over stuff. Plus this book has like... Three to Four alternate titles. well if anything is different, which i don't think so but who knows, i hope someone tells us so i can put it online. Just a hunch, but I'd think MM11; a full, complete Archie comic cover section (MM25 only was up to Issue 21); Ariga Mastermix Covers; new Megamission card art; Legacy Collection covers; anything X Collection we haven't been spoiled to yet; TruForce figure concept art; MvC: Infinite art; Project X Zone 2 art; possibly Smash Bros. art; and the teased Megaman 8 cutscene cel scans would all be fairly obvious additions to an updated book for MM30. Sure doesn't feel like that much happened over the last 5 years, but that's a decent amount of content they could easily add, I'd think. One left in stock now. Price is going up. I got it. I understand now. Thank you for clarifying it up. No, it is too new so maybe for the next 35 years anniversary book, who knows.